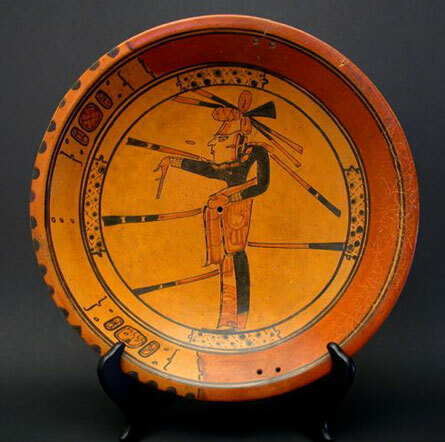 With central tondo decorated with a standing figure, facing right, probably of the Holmul Dancer, gesturing with extended right arm, the left bent at the elbow, wearing large and elaborate headdress with long feathers and sash, beaded necklace, and long layered robe, surrounded by bands of criss-cross and dotted designs, another band containing glyphs, and narrow flattened outer rim; painted in pale orange with black and darker brownish-orange, the tripod feet now missing; area of ancient repair. Property of the Munson-Williams-Proctor Institute, Utica, New York, this plate was acquired in 1968 from Andre Emmerich, New York. The Accession Number is marked in red on the reverse side: "MWP 68.6". This object is sold with a report on Thermoluminescence Authenticity Dating by the distinguished Daybreak Archaeometric Laboratory Services, Guilford, CT. Condition: There are ancient repairs, evidenced by two sets of two drilled holes located on opposite sides of the plate. There are three breaks, and one small area of modern fill on the reverse side, approximately two inches in length. There are minor chips on the circular ridges of the tripod inserts. There are sporadic root markings over most of the reverse side and a portion of the right edge of the plate.